The numerous phytoplankton investigations carried out in Antarctic waters during the past few decades have dealt primarily with the taxonomy and distribution of the organisms. 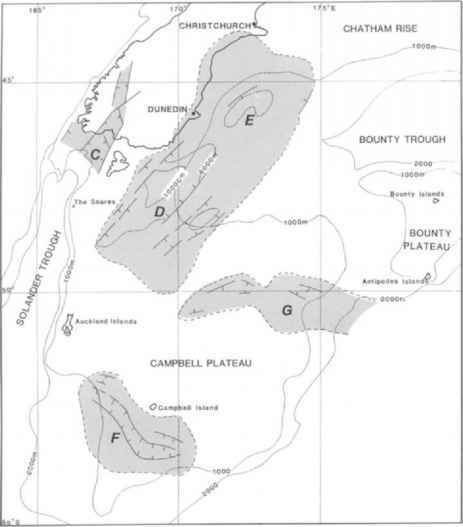 The publications of Kozlova (1964) and Hasle (1969) dealing with the systematic composition and distribution of the phytoplankton (diatoms in particular) in the Pacific Sector of the Southern Ocean are of special interest. Very little attention has been given to the study of the life history, physiology, metabolism, and population dynamics of these algal communities. The phytoplankton assemblage of the Pacific Sector of the Southern Ocean (and in the Southern Ocean generally) is dominated by diatoms, with smaller numbers of dinoflagellates and silicoflagellates. In a detailed study of the water samples of the Pacific Sector of the Southern Ocean from the Norwegian Brategg Expedition (1947-48), Hasle (1969) listed about 100 diatom, 70 dinoflagellate, 5 coccolithophorid, and 5 silicoflagellate species. 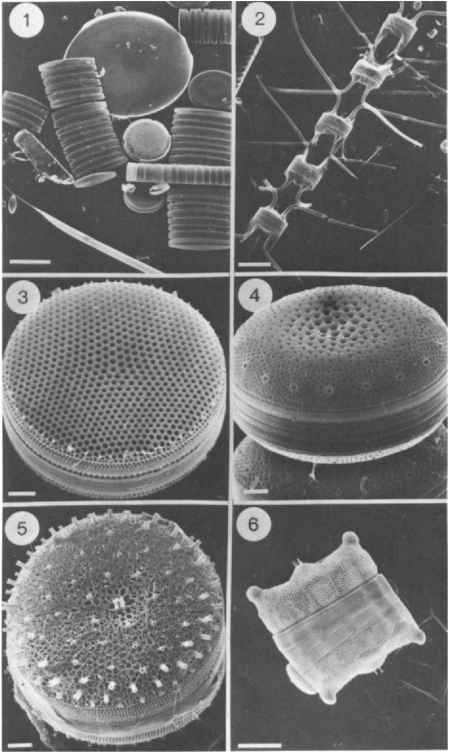 Diatoms of the genera Chaetoceros, Coscinodiscus, Nitzschia, Rhizosolenia and Thalassiosira generally dominate the Antarctic phytoplankton (Fig. 8.3). Each of these genera is represented by 10-15 species. Hasle (1969) listed Chaetoceros neglectus, Nitzschia "barkleyi", and Cocco-lithus huxleyi (a coccolithophorid) as the dominant species in the flora of the Subantarctic Zone; Chaetoceros dichaeta, C. neglectus, Nitzschia "nana", and N. "closterioides" as dominants in the northern Antarctic Zone; and Nitzschia curta, N. cylindrus and N. subcuruata as dominants in the southern part of the Antarctic Zone. distribution (with truly disjunct biogeographical populations), but examples do exist. Bipolar species include Thalassiosira antarctica, Porosira glacialis, and Nitz-schia cylindrus (Hasle, 1976). Because Antarctic dinoflagellates (Fig. 8.4) are rather small and are often encased in weak and easily deformed plates, they have been only poorly studied. Although the number of dinoflagellates appears to be significantly smaller than the number of diatoms, the dinoflagellate biomass in the Antarctic has probably been underestimated. 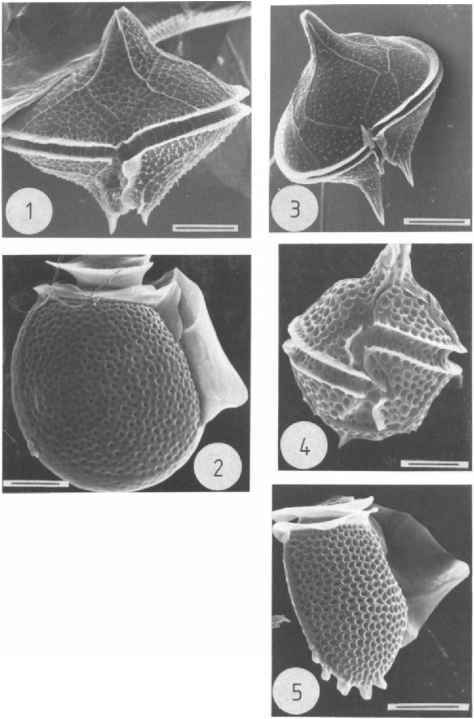 Dinoflagellate-dominated phytoplankton assemblages have been reported; therefore, at least in isolated cases, their contribution to the biomass is significant (Balech, 1970). Only a few thecate genera (those encased in cellulose plates), chiefly Proto-peridinium and Dinophysis, are represented in the Antarctic dinoflagellates. Of these, Protoperidinium is by far the most abundant, both in number of species and in number of individuals. Naked, or thin-walled, dinoflagellates are probably not as rare in Antarctic waters as they seem. The assumption that they are rare is due, in part, to preservation and fixation procedures which render them unrecognizable. However, eight naked species of Gymnodinium, four of Gyrodinium, and two of Amphidinium, as well as the species Pyrocystis pseudonoctiluca have been identified in the Antarctic (Balech, 1975). As far as we know, Arctic and Antarctic waters have only a very few cosmopolitan species in common. Three bipolar species are known : Protoperidinium antarcticum, P. saltans, and P. thulescence. The latter has also been reported in sub-Antarctic waters. Endemism is high among Antarctic dinoflagellates; no less than 35 species, many belonging to the genus Protoperidinium, being limited to the Antarctic region. However, cells are occasionally found in sub-Antarctic waters, probably transported by the isolated "rings" or meanders of Antarctic waters in the region of the Polar Front (El-Sayed and Hofmann, 1986). In no other oceanic region do the dinoflagellates attain such a high degree of endemism (80-85%) (Balech, 1970). Nitzschia sp., Scale marker = 50 (im. 3-2 Chaetoceros dichaeta, Scale marker = 25 |im. 3-3 Thalassiosira symmetrica, Scale marker = 5 (im. 3-4 Thalassiosira gracilis, Scale marker = 2 |im. 3-5 Thalassiosira gravida, Scale marker = 2 |im. 3-6 Biddulphia sp., Scale marker = 50 (im. Scale marker = 30 (im. 4-4 Gonyaulax digitale, Scale marker = 10 |j.m. 4-5 Dinophysis tuberculata, Scale marker = 20 |j.m. Phaeocystis pouchetii belongs to the order Prymnesiales and is one of the few non-diatom algae which is exceedingly plentiful in southern Antarctic waters. Phaeocystis occurs in either a unicellular motile form or a colonial palmelloid stage which can be large enough to be visible to the naked eye. This alga is very widely distributed in warm and temperate waters as well as in Antarctic and Arctic seas. Its gelatinous blooms are sometimes known as "Dutchman's baccy juice", and the jelly-like colonies are so thick that they clog plankton nets. Extensive blooms of Phaeocystis have been reported in the Ross Sea (El-Sayed et al., 1983) where high cell concentrations extended from the surface to depths of 100-150 m. Distinct disoloration of the water (greenish-grey to greenish-brown) accompanied this bloom, resulting in considerable submarine light attenuation. Silicoflagellates are unicellular chrysophycean algae. Occasionally, cells may be linked together to form simple, small colonies. The silicoflagellates have an internal skeleton of conspicuous hollow siliceous tubes, forming a spectacular symmetrical structure containing many chloroplasts. Only one species of silico-flagellate, Dictyocha (Distephanes) speculum (Fig. 8.5), is generally abundant in Antarctic waters; it sometimes outnumbers any species of diatom (Balech, 1970). Dictyocha speculum is larger than many diatoms and should not be overlooked as a contributor to phytoplankton biomass and primary production in Antarctic waters. 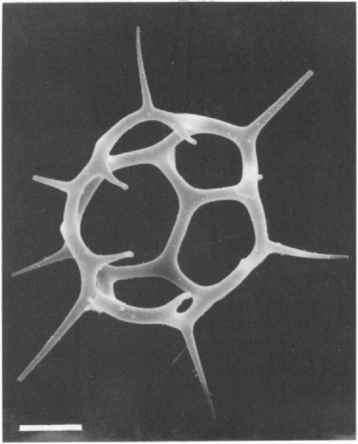 Hasle (1969) listed monads, flagellates, and coccolithophorids as regular components of the phytoplankton within the Pacific Sector of the Southern Ocean. The coccolithophorids are generally restricted to the Subantarctic Zone. Fig. 8.5. Antarctic marine silicoflagellate Distephanes speculum, Scale marker = 5|im. (Photo from : C. Park). column of water extending from sea surface to the depth to which 1% of surface light intensity penetrates; in the Pacific Sector this depth averages 80 m with a range of 50-150 m) average 12.62 mg/m2 in the Pacific Antarctic (El-Sayed, 1968). Within the water column, chlorophyll a exhibits maximum concentrations at depths corresponding to 25-50% of surface light intensity (Fig. 8.7). Below these maxima, there is a gradual decrease in phytoplankton biomass to the bottom of the euphotic zone, below which the biomass is usually much reduced (El-Sayed, 1970a; El-Sayed and Turner, 1977; Holm-Hansenetal., 1977). However, substantial amounts of chlorophyll a are sometimes found below the euphotic zone, as for example, at several stations during Eltanin Cruise 51 in the Ross Sea (Fig. 8.8).